← How Much Do I Water? Have you thought about growing currants? Currants are prized for their distinctive flavor in juice, jam, jelly, pies and desserts. They are rich in Vitamin C. The smell of the blossoms in the spring have a heavenly sweet fruity scent that make you want to park yourself with a good book and a chair right next to them. If you don’t grow them for the fruit, you should just for the smell! You can pick from black, red or white currants. Try a few of each! Currants are cold hardy and they will grow in most areas. If you live in area like I do here in Southern Utah, picking your spot where they receive dappled light and afternoon shade is best. Our temperatures can reach in the triple digits for three months straight, and the direct sun isn’t the best growing conditions for currants with high temperatures like that. Cooler temps, full sun is fine. Soil is important for your currants. They don’t like to live in clay soil and sandy soil drains to quickly, so amending the soil is a must. Add compost and peat moss to the planting spot to give your currants a nice home. Currants can live to 10-15 years. So pick your spot wisely. I fertilize with an organic food called Acid Mix. It not only feeds the plants, but also helps lower the pH. If your pH is already low I would just use an All Purpose fertilizer. Currants like a pH in a range of 5.5 to 7.o. I like to apply fertilizer in March when buds are swelling and again in mid-May to give the fruit a boost. I just sprinkle a cup around each base and cover with a layer of compost and water in. Side dressing with compost through the year will improve growth and plant vigor. If you live in a low rain fall area make sure your currants get adequate water supply from bloom time until the end of harvest. Add enough water to moisten the soil to a depth of 6 to 8 inches, then let the soil dry out somewhat before you water again. Excessive water may suffocate the roots. Prune when the plants are dormant in late winter. Don’t over prune! Black currants produce best on 1-year-old wood whereas red currants produce most of their fruit on 2 – and 3-year old wood. 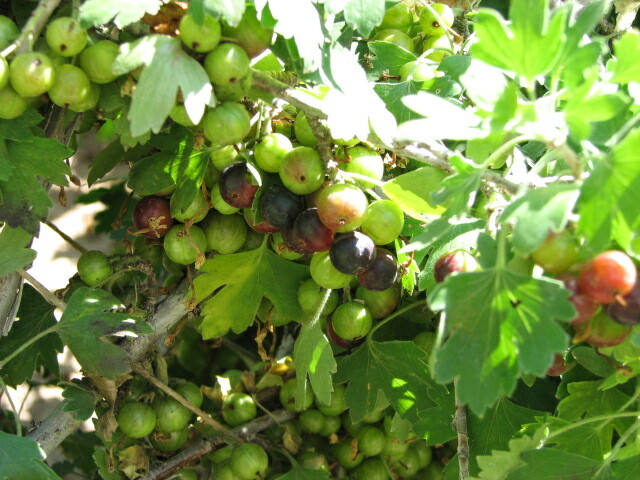 Currants can be grown as a fan-shaped bush on a trellis. Plants trained this way look attractive and produce a good crop of well-colored fruit. Currants will start to produce a light crop the year after planting. I like to purchase 2-year-old bushes to get a head start. The berries will ripen over a 2-week period. By the time they reach 3-4 years plants can bear full crops. A yield of 4 to 6 quarts per mature bush. Make More! You can propagate currants from 1-year-old wood during the dormant season. Make cuttings from 6 to 8 inch long pieces. Make a flat bottom cut just below a bud, and slanted top cut about 1/2 inch about a bud. Dip each bottom end into a rooting compound and set them into well-drained soil in a greenhouse. keep moist and out of direct light. I cover mine with a shade cloth. Come spring time you will have roots forming and you can transplant carefully into a larger pot or outside when the weather warms. Currants are generally self-fertile, and you only need one cultivar for fruit production. However, both black and red will produce larger fruit if you plant more than one cultivar and have cross-pollination. So this is your excuse to have more than more variety! Dried currants are as easy as picking the fruit and letting it dry. They are like raisins, only better! I like to use the black currants for drying. Just simply pick the ripe fruit, wash and set in a food dryer. If the weather is warm and dry I like to use my outside hanging rack. Otherwise if it’s humid I will use my electric dehydrator. 4 pounds red currants, 4 3/4 cups granulated sugar, 7 oz water, juice of 1 small lemon. Rinse the currant in cold water, stem them. Put them into a preserving pan and bring to a boil with the water. Cover th pan and let the berries soften over low heat for 5 min. Collect the juice by pouring this preparation into a fine chinois sieve, pressing the fruit lightly with the back of a skimmer. Now filter the juice again by pouring through a cheesecloth that you have wet and wrung out. Pour the juice into a preserving pan with the lemon juice and sugar. Boil for 5 min. Skim carefully. Check the set. Put the jelly into jars immediately and seal. makes about 4 1/2 cups of the most beautiful jelly ever! I love reading your blog. It’s great to have so much information specific to living right here in LaVerkin. I would love to know what your thoughts are on growing tomatoes in pots. The larger the pot the better! Tomatoes (or anything for that matter) drys out so quickly in pots here in the “hot” weather. I would plant a determinate variety. They are sturdy plants and need only a stake to hold them up and they seem to tolorate the heat better. I DON’T like upside down tomatoe plants (sorry everyone :)). Make sure you keep them moist. Afternoon shade would be great! You need to fertilize more often because they are in pots and the nutrients wash out much quicker. I always grow some in pots just for fun. They will never produce huge crops, but having some fresh tomatoes growing on the back porch is always a treat! Thanks! We do have afternoon shade and so far the plants seem to be doing well. I love currants, lightly steamed broccoli florets, chopped red onion, grated carrot, bacon bits and Brianna’s poppy seed dressing. Yum good salad! Your picture is of gooseberries? These are black currants…Not ripe yet, but getting there.